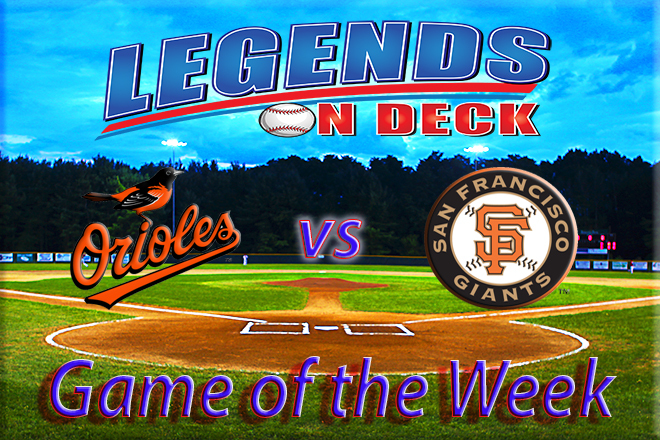 After a strong showing by some keep players on offense, the Baltimore Orioles earned an important Legends on Deck game of the week victory against the San Francisco Giants that had implications in the MLB standings. On Friday evening, the Orioles defeated the Giants, winning the first of a three game series by a 5-2 score. The O’s took advantage of an opportunity to climb back into first place in the AL East during the game of the week. The Houston Astros defeated the Toronto Blue Jays earlier in the evening. As a result of Baltimore’s victory, the club currently has a half game lead over Toronto in the AL East. The Giants are also in a tight divisional race in the NL West. The Los Angeles Dodgers were defeated 4-1 by the Pittsburgh Pirates on Friday. Despite San Francisco’s loss the club maintained their one-game lead over the Dodgers in the divisional race. Baltimore earned the game of the week win largely because of a strong start by budding young star pitcher Dylan Bundy. Bundy now has a 6-3 record on the season which includes victories in his last three appearances. In Friday’s game against the Giants, Bundy pitched for 5.2 innings allowing just three hits and one earned run. Bundy also walked two and struck out three during his Friday evening tenure. Matt Weiters opened the scoring for the O’s. He hit a double off of San Francisco’s starter Matt Cain in the top of the second inning. This hit drove home Jonathan Schoop to give Baltimore an early 1-0 lead. Later in the inning, Adam Jones hit a single that drove home Weiters to up the score to 2-0. The Orioles’ offensive firepower was on full display in Friday night’s contest. Mark Trumbo hit his 33rd home run of the season in the top of the third. The blast was a 441-foot shot that brought home Manny Machado giving Baltimore a 4-0 lead. Trumbo’s blast was followed up by another strike later in the game. Chris Davis hit a solo home run, his 24th of the season, in the top of the fifth to give the O’s a 5-1 lead. Both Davis’ and Trumbo’s hitting stats have been down a bit since the All-Start break. From an Orioles’ perspective, the team is hopeful that Friday night’s performances by these sluggers will help them return to form in time for the club’s playoff push. With strong pitching from the Orioles on Friday, the Giants struggled to get much going on offense. At the bottom of the third, Denard Span hit a double and Joe Panik scored San Francisco’s first run of the game. A wild pitch by Baltimore’s Brad Brach in the bottom of the ninth set up another scoring play. Following the pitch, Giants’ Brandon Belt hit a line drive that scored Angel Pagan to make the game 5-2. Denard doubles. Panik scores! #SFGiants are on the board. The O’s put stud closer Zach Britton into the game during the ninth inning and he cemented the team’s 5-2 victory. Britton earned his 36th consecutive save of the season. Despite the struggles of some of the Orioles’ starters, the team’s relievers and closers have performed well and have been a big part of the team’s success this season. San Francisco’s pitcher Cain earned the game of the week loss on Friday. Cain pitched for four innings where he allowed 11 hits and five earned runs. The 31-year-old retired seven through strike outs and walked one batter. Consequently, Cain now has a 4-7 record on the season. The Giants and the O’s will continue the series in game two on Saturday night at AT&T Park. The final game is an afternoon tilt that will be played on Sunday. The Orioles will return home in a crucial divisional series against the Boston Red Sox that begins on Tuesday. San Francisco will begin a three game series at home on Monday against the Pittsburgh Pirates. Zach Britton’s consecutive save streak dates back to last season. He has now earned the save in 38-consecutive opportunities. Matt Cain has allowed 65 hits and 32 runs in three wins and four losses at AT&T Park this season. In comparison, despite his 1-3 record on the road, Cain has allowed 32 hits and 18 runs away from his home park this season.